Executives at HTC will be waking up like bears with sore heads this morning after learning that an internal sales brochure has been leaked ahead of the official announcement of the all new HTC One. It seems that someone within Telstra has not only been responsible for letting the document get into the public domain, but has also managed to inadvertently confirm the majority of the new HTC One’s specs, including the purpose of that dual camera module which we’ve seen in plenty of leaks before. 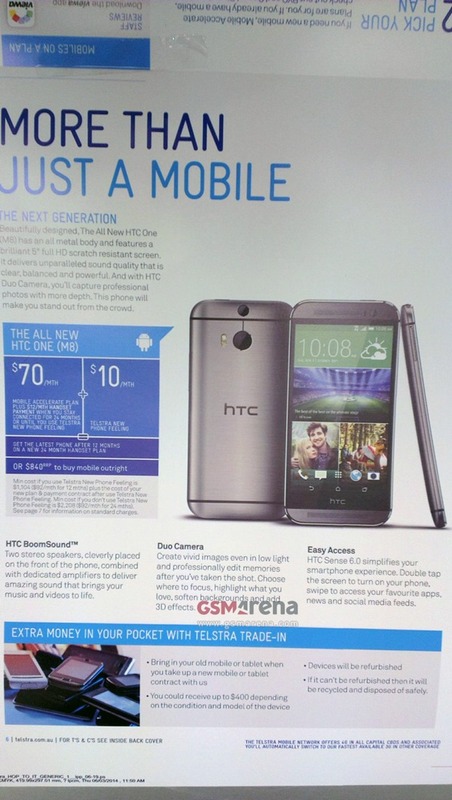 The document, which looks like it is intended to function as a print sales advertisement for Telstra, introduces the new HTC One as “more than just a mobile“, stating that it represents the next generation of mobile devices. The new HTC One (M8) is manufactured with a premium all-metal exterior, with the main focal point of the device being the 5-inch full high-definition, scratch resistant display. The hardware will weigh in at 160 grams and will be slightly thicker than the model that it replaces at 9.35 mm. As previously reported, the M8 will ship with a Snapdragon 801 processor and the latest version of the Android OS, which is KitKat. Those who are potentially interested in purchasing the new HTC One when it is officially launched by HTC may be interested to read about what the company is calling “Duo Camera” and “HTC BoomSound“. The BoomSound technology comprises of two stereo speakers that have placed on the front of the device and paired with dedicated amplifiers to provide a superior sound track for audible media. The double camera module on the rear of the new HTC One is designed to provide an enhanced photography experience. Users will be able to choose where to focus, edit photographs when the shot has been captured, select specific areas to highlight and add a number of 3D effects to the scene. The Telstra leak looks like it could definitely be a legitimate source of information, especially considering it seems to confirm what speculation has already pointed to in the past. With HTC planning on unveiling the M8 in just a couple of weeks, we don’t need to wait long to see that Duo Camera in action. Bring on the new BoomSound, that’s what we say.